Adding mushrooms to the beer brew. 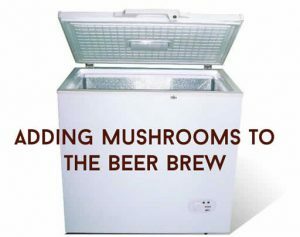 There are different ways to add mushrooms while brewing the beer. Some are better than others. Magic mushroom brewing is a closely guarded secret. Some steep whole dried mushrooms in the wort. The wort is the beer starter made from a mix of malt mash and water. Other flavors and hops can be added to the mix. It is brought to the boil for an hour until it reaches the hot breaking point. This is when the proteins release and become visible on top of the boiling mixture. Adding mushrooms at this stage turns it into mushroom soup. Once it cools down add the yeast and leave to ferment. Note that if using magic mushrooms in the wort, the psilocybin will boil away. Others grind up the dried mushrooms into a powder and steep it into a tea. This mixture is then added to the beer after the fermentation stage and then bottled. This is tricky to get the correct dosage as you won’t know how much precisely was absorbed into the beer. Another method is soaking the mushrooms in vodka for a couple of weeks to make a tincture to add to the beer brew after fermentation. This method can add a bitter flavor to the beer. So, you may want to find another way. A better method is processing the mushrooms by freezing them. This gives a better flavor. Lightly clean the mushrooms and then chop them up. Never clean mushrooms with water. Put them into a bag and vacuum seal them and deep freeze. There is no need to sanitize or clean them too much as it dilutes the mushroom flavor when they defrost. Super deep Freezing kills off any microbes. Take the mushrooms from the freezer to defrost at least a day before you want to use them. Tip the whole lot into a sanitized container and rack the beer onto the mushroom mixture.